Our Source Correcting Light Meter measures visible light in both Lux and Foot Candles in three ranges. 0 to 2000/20,000/50,000 Lux and 0 to 200/2,000/5,000 Fc. Resolution: 1/10/100 Lux, and 0.1/1/10 Fc. Accuracy is ± 4% of full scale for all ranges. 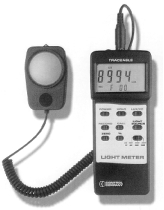 This unit corrects for four lighting source types: Daylight, Tungsten, Fluorescent, Mercury. Features include min/max/avg recall, % differential, hold, zero adjust, low-battery indicator, auto off, and RS-232 interface. The meter operates on one 9 V battery (included) and comes with remote sensor, protective holster and instructions. The meter measures 2-7/8"W x 7"H x 1-3/8"D.